A new online newspaper has been launched to cover local news across the West Yorkshire area. 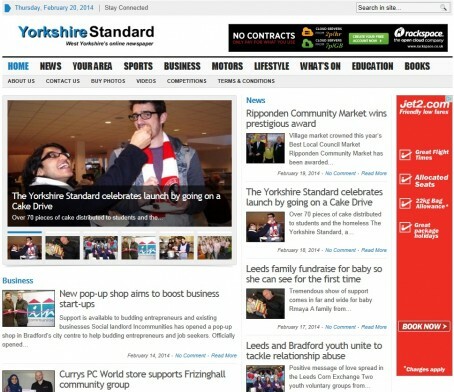 The Yorkshire Standard is the brainchild of former Huddersfield University student Hasan Faridi and aims to provide up-to-the-minute coverage of community news, business and the local arts scene. It will serve the areas of Kirklees, Bradford, Calderdale, Wakefield and Leeds and claims to have already recorded more than 2,500 unique visitors in its first days of operation. The launch content included a charity appeal to help a child in Leeds and a video news report about a community kitchen in Bradford as well as offering photographic sales and a lifestyle section. Hasan said he was pleased with the level of audience achieved in the website’s first few days. “I worked full-time for two newspapers after I graduated, and decided to go on to do bigger and better things by starting up my own newspaper with an online twist,” he said. “Our strong point is that we are community-centred, and focus on all sorts of news from within West Yorkshire, be it local news and business to music and films. The publication will rely on volunteer contributors – currently around a dozen – although Hasan hopes the site could eventually hire staff. Good luck Hasan – but please reconsider what looks like a policy of making your online newspaper ‘good news’ only. The reason ‘bad news’ or rather ‘un-scripted, off agenda, off diary, incidents, accidents and happenings’ sell newspapers or websites is because people are genuinely interested in reading about them. it doesn’t make them, or you, bad for including them. To the above comment ^ Don’t think it’s ‘good news only’, think it’s mainly just trying to do something different from the usual garbage that makes the front page nowadays! Did work experience at a Bradford paper and it was easy to get the front page for crime. Saw people just copy paste a press release and ask for a pic off police. Lazy…..
There’s nothing wrong with ‘good’ news but I tend to agree with Confused here. New websites like this tend to dismiss traditional news as ‘bad’ or sensationalist which is often nonsense. I suspect it’s more of an economic decision because public interest news is expensive to produce. Compare the stories leading the news sections of the Yorkshire Standard and the Yorkshire Evening Post today: “Ranger Rob and reptiles take Leeds public on a wild adventure,” and “The ‘lost generation’ of Leeds pre-school children.” I know which one I prefer. That said, I wish Hasan all the luck in the world because this kind of entrepreneurial journalism can only be a good thing given the cuts to the rest of the industry. All the best Hasan, nice to see such journalistic spirit! It’s a shame much of the inspiration from stories comes from local papers, with no accreditation. Lj by any chance, do you know how many journos in the top business get their stories nowadays? Via press releases and press contacts who happen to forward out mass emails, which they just regurgitate. This is coming from a guy who has worked at a meaty salary position in London at a popular tabloid. Lj has it the wrong way round lol. I did some digging and found that the bradford t&a copied off this yorkshire standard.